Home / Video / Dodge vs Ford vs GM in a Tug of War contest causes a chain break!!! Dodge vs Ford vs GM in a Tug of War contest causes a chain break!!! 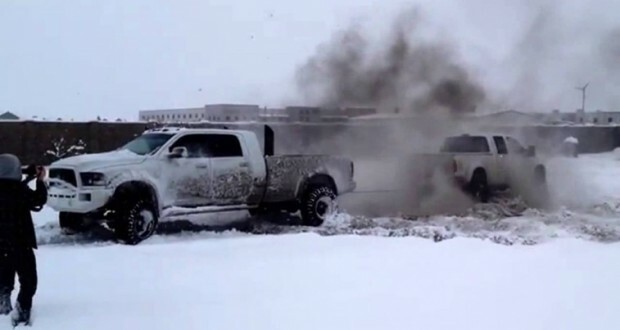 In a freezing winter time, when the ground is covered with snow and you want to heat things up while you have in possession a best diesel engine machines your money can buy, there is only one crazy thing left to do; TUG OF WAR car contest!!! You must watch these road warriors giving their best to collect the glory of the traction and torque! We weren’t sure who won this braking chain even after few burnouts! Well…why don’t you try to become a better judge then we did by checking up a video below! Who is really the King of these wild torque machines? Duramax, Powerstroke or Cummins?